A chicken dish is a must have at the Chinese New Year Eve reunion dinner. Typically the chicken is served whole with the head and all, symbolizing wholeness and prosperity. When I was a kid, the silky smooth “pak cham kai” (in Cantonese dialect) or “white cut chicken” was very popular. This dish is similar to the Hainanese Chicken I posted some months back. Most families will pre-order an organic chicken known in Malaysia as “kampung” or village chicken, for that purpose. I remember one year, someone actually gifted us with a life chicken. Mom and aunt had the task of slaughtering the chicken and preparing it. Please use your imagination for the rest of the story. Suffice to say the dish wasn’t very popular with the kids that year. 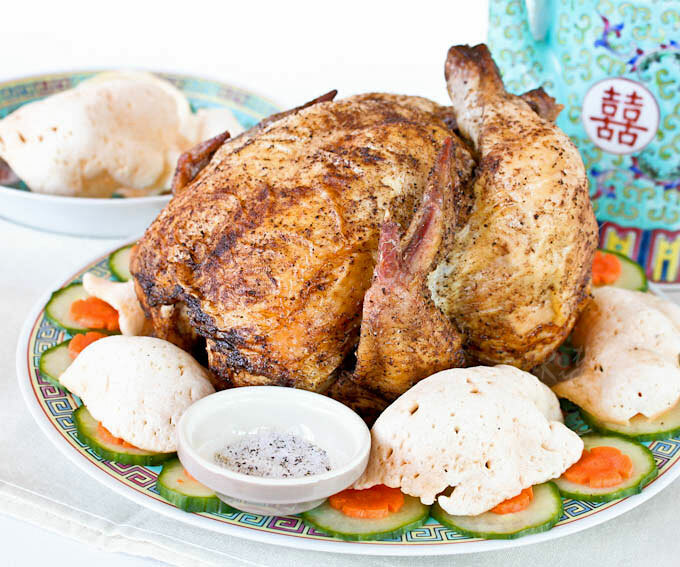 An alternative to “pak cham kai” is this Chinese Five-Spice Roast Chicken. 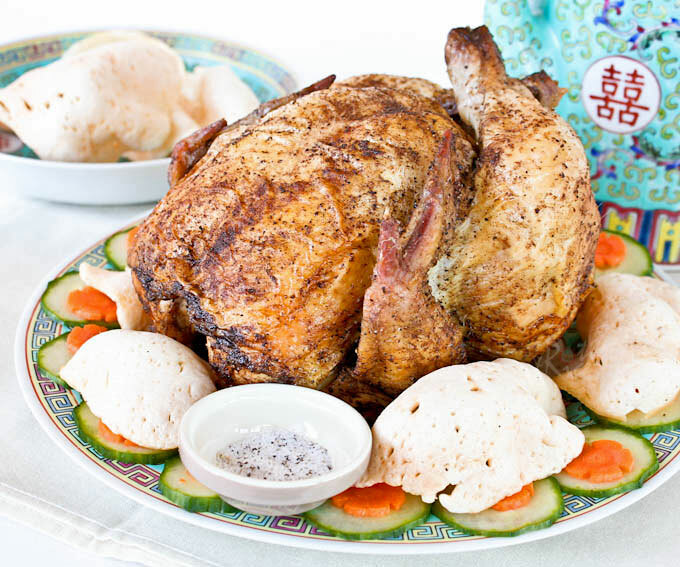 Often served at the Chinese 10-course wedding banquets, this delicious roast chicken is accompanied by shrimp crackers and pepper salt. This is one of the few dishes eaten with salt instead of soy sauce. Of course this was a favorite with the kids at those banquets, if they can look beyond that chicken head. Thank goodness that “garnish” seldom appear on the plate these days! The chicken can be marinated overnight with ginger, scallion, and Shao Hsing rice wine. It is then drained, air dried, applied with a rub, and air dried again for several hours before roasting. The version shown here is simplified one where the chicken is placed on a beer can roaster so that it sits upright during roasting. The juices drip onto the pan producing a chicken with crispy skin. The fragrant salt is easy to prepare and is good with most meats. Here is what the beer can roaster looks like. A can of beer or soda may be placed in the center to flavor your roasted chicken. I will have to give it a try one of these days. Remove giblets and excessive fat from chicken. Rinse chicken including the inside. Pat dry the outside and place it on a beer can chicken roaster to drip dry for an hour. Pan fry sea salt and ground white pepper over medium heat for 4 to 5 minutes or until fragrant. Combine half of the pan fried pepper salt, five-spice powder, and garlic powder in a small bowl. Reserve the other half of the pepper salt for serving. Remove chicken from the roaster and liberally sprinkle or pat mixture on the inside and outside of the chicken. Place chicken back onto roaster and allow it to dry for another hour. 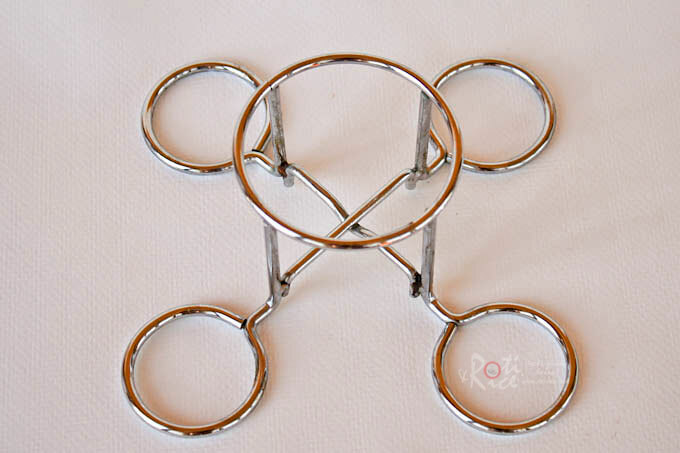 Truss chicken by tying the lower part of the wings and legs together. Roast chicken in pre-heated oven on the beer can roaster for approximately 1 hour 15 minutes or until thermometer inserted into the thickest part of the thigh without touching the bone registers 180°F. Remove roasted chicken from the oven and let it rest for 15 minutes before carving. Serve chicken with slices of cucumber, shrimp crackers, and pepper salt. I always like this very traditional way of home-roasting chicken but not brave enough to roast one on my own. I find your step by step instructions very helpful and will definitely use your instructions if I’m roasting my own chicken. This looks so good! A great way to change up classic roast chicken. I’ve never used a beer can roaster or even seen such a device – so interesting! Thanks! Beautiful roasted chicken, I especially like the 5 spice rub…so tasty. Beautifully done. Thanks Juliana! 5-spice is wonderful with chicken. Oh my gosh, that looks delicious. I love 5-spice powder and plan to make this very, very soon. I have to say, I hope no one ever gifts me with a live chicken! That must have been horrifying for your mom. What a story though! Thanks Christiane! I hope you enjoy the recipe. This is a nice chicken dish for CNY reunion dinner! If you are interested may consider submitting this post to Aspiring Bakers #15 – Auspicious Dishes for CNY (Jan 12) hosted by me. Good to see you here, my friend. 🙂 Haha…so they do still serve it with the head!! I wonder how my boys will react to such a sight. It is one thing to grow up with it but I can imagine it must be quite shocking to someone not familiar with it at all. Miss those wedding banquets. That chicken looks delightful! I love roasted chicken and I have to try this version! Looks so crispy and tasty! Happy New Year to you and your family! I have been reading all your posts but I have not been able to put my comments in, apologies! This chicken is absolutely delicious – just made it last night with 2 chicken leg quarters. I had forgotten how delicious this simple rub can be. My husband liked it too, even though he is not a fan of 5-spice. Thank you! I love 5 spice too. The chicken is perfectly roasted. Miss shrimp crackers. Biren, I think the five spices is magical. It enhances the taste of all kinds of meat. I am sure when you roast this chicken, the whole house is filled with the spice fragrance. While typing this comment, I can feel myself salivating. The beer can device look so interesting. I will definitely buy one and use it if I spot it someday! 5 Spice is a wonderful spice mixture. Chicken is a perfect vessel for it. Your beer can roaster is a neat gadget! Never seen one before! This sounds so simple to make but looks really tasty & flavorful. Hope I could try this one of these days! You must be so busy preparing for CNY! We always celebrate it with friends at a restaurant so I’m not very familiar with traditions or traditional food that people make at home. This roasted chicken looks so yummy! We can eat it for regular days, maybe for me with drummets or drumsticks. Drooling as I imagine the taste! that’s a great looking chicken Biren. 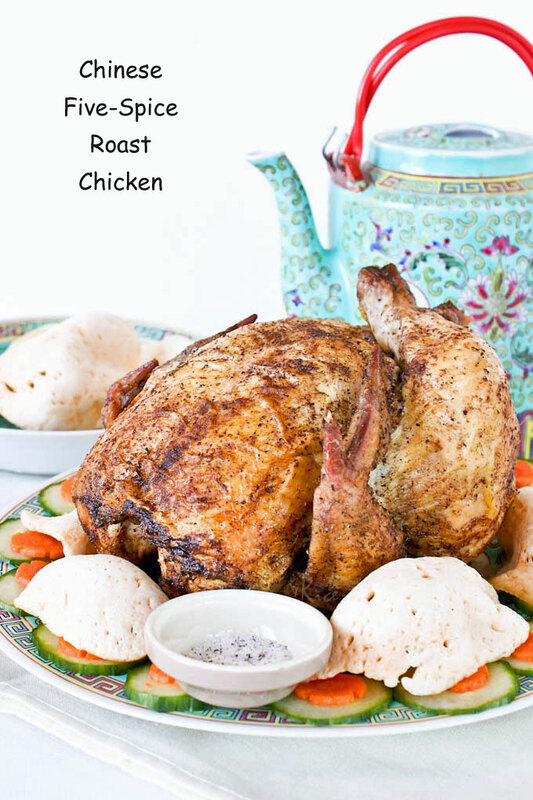 Easy and delicious roast chicken with five-spice! Yum! Biren – My next roast chicken will definitely have the 5-spice powder. I also need to try this beer can method. I keep hearing about it but have never actually tried. Your chicken looks really crispy! I love hearing of all the dishes and what goes into the CNY celebration. I love beer can chicken, you should really try it that way sometime. I have seen the beer can gadget at Walmart. It reminds me to pull mine out again and use it…funny how we get away from some methods for awhile. I am using your simple but delicious 5 spice blend. Yes, I must definitely try the beer can roast chicken soon. I hope you will give this a try as I think you will enjoy it. It is so simple too! Yum! What a recipe. I have a chicken waiting to be cooked and I think I’m going to try this! Wow, this chicken looks awesome! looks easy and yummy! I can’t wait to try! Any idea where can I get that beer can roaster? In the US, this beer can roaster can be found in any of the major retailers, grocery and kitchen stores.